Was this the greatest football game ever? OK, maybe not. But "Harvard Beats Yale 29-29" still spins an improbable, Fitzgerald-meets-Updike yarn about two elite schools, a turbulent year and an unbelievable ending. 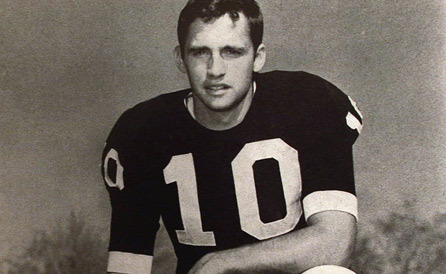 Brian Dowling, captain and quarterback of the 1968 Yale football team, in "Harvard Beats Yale 29-29." I'm sure that football fans in the southern and western seven-eighths of the country would dispute the point vigorously, but for a certain Northeastern upper-crust sector of American society, no single event in college gridiron history comes close to the legendary status of the Harvard-Yale game that occurred almost exactly 40 years ago. It almost goes without saying that it's an unfair standard. There have been other memorable games -- between USC and Notre Dame, Ohio State and Michigan, Alabama and Auburn -- that far more people attended and passionately cared about. But none of them occurred between America's two most elite educational institutions in a year of multiple assassinations, widespread campus uproar and social turmoil, and in a year when both teams (defying their long traditions of academic excellence and athletic mediocrity) were undefeated. And as the title of Kevin Rafferty's film about the 1968 game, "Harvard Beats Yale 29-29," may suggest, few sports events have ever ended in such an improbable and dramatic fashion. Rafferty's technique is deceptively simple, and disarmingly effective. He shows large chunks of the charmingly old-fashioned 1968 game broadcast (from Harvard's TV station), while mixing in interviews with the surviving players, at first an interchangeable roster of hale, hearty and universally white lawyers, bankers, businessmen or academics in their early 60s. (Yale running back and future Dallas Cowboys star Calvin Hill was the only prominent African-American on either team, and his absence from the film is mysterious, given that he's still alive and operates a sports-consulting business.) Gradually the story of the game and the individual stories of the men who played in it -- legacy blue-bloods, scholarship kids from South Boston, Midwestern farm boys who'd never been to the East Coast before going to college -- wrap themselves around you, and you come to understand why it was such a powerful and peculiar event. As the game grinds on toward its culmination, with Yale seemingly in control (when Yale fans got tired of chanting "We're number one!" they began taunting the home faithful with chants of "You're number two!") but never quite delivering the knockout blow, all those faceless white men begin to become individuals. The beefy Levin ruefully reflects on his critical fourth-quarter fumble, one of five Yale fumbles that day. Yale defensive back Mike Bouscaren admits frankly that he was hoping to drive Harvard quarterback Frank Champi out of the game with a late hit, one of four or five crucial mistakes that cost Yale a certain victory. What happened then? Harvard scored 16 points in the last 42 seconds, to "win" a game that ended in a tie. (There were no tie-breaking overtimes in football at the time, and it's a good thing too. As several players note, if one or the other team had won, no one beyond the players and a few diehard fans would remember the game today.) That event on Nov. 23, 1968, didn't have anything to do with MLK or RFK or LBJ or the Chicago protests or the Vietnam War; it was a competing headline, a distraction from those things. Rafferty, who was a Harvard undergrad at the time, renders the game a vivid and compelling experience even if (like me) you're not from the Northeast, didn't go to an Ivy school and don't give a crap about football. Social significance? I don't know about that. But "Harvard Beats Yale 29-29" is a ripping good yarn, like a Fitzgerald short story rewritten by John Updike, with an uproarious, impossible Hollywood ending. "Harvard Beats Yale 29-29" is now playing at Film Forum in New York, with more cities and DVD release to follow.